Starting a journalism-project blog with a story about a camera, typical I know, but bear with me. For as long as I can remember, I’ve always been a visual learner. When I got my first camera, I took it out of the box, tossed aside the directions and simply played around with it until I understood how to use it. I wanted to watch and see until I could do it on my own. The other morning, I went to Cecilia’s house to shoot some B-Roll. As we watched her cook and sew, she explained a very crucial aspect to the Yup’ik culture. Like any culture, the Yup’ik people had established a way for their children to learn and pass on their cultures and traditions. They valued and respected their elders, and therefore utilized them as teachers. Children raised in the Yup’ik tradition were taught by watching and memorizing. Nico watching (through his camera) how to water-proof sew boots. A parent or elder would call the child over as they sewed, prepared dinner, got ready to hunt, etc. and say, “Come sit. Watch.” and from there the child would sit, watch, memorize, and learn how to properly perform the task. 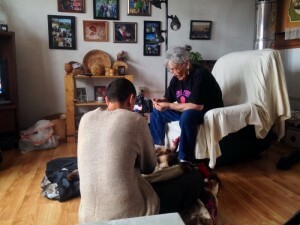 My interest of listening and watching grew even more when we interviewed Charles, a young native Yup’ik. As he timidly sat in his chair, he explained that it was difficult for him to hold eye contact with us because of how he was raised. His grandparents had taught him that to show he was listening, he had to look at the person’s mouth, the complete opposite of western culture. There is a deep tradition and beauty in learning from someone simply by being quiet and watching. It works along with the Yup’ik’s ways of community and connectivity. In order to learn the skills needed to survive, you had to be present in the moment. You needed to show respect and give attention in order to be successful. When I tried to teach myself how to work my camera for the first time, I was confused and a little lost. I didn’t want someone to try to explain it to me using words, I wanted to see the different features, the different buttons and how they worked. This theme struck a chord with me. As I continue to learn more, it’s proving that while the Yup’ik culture is different, it’s also one that I could relate to. We both value learning by watching, and eventual doing.